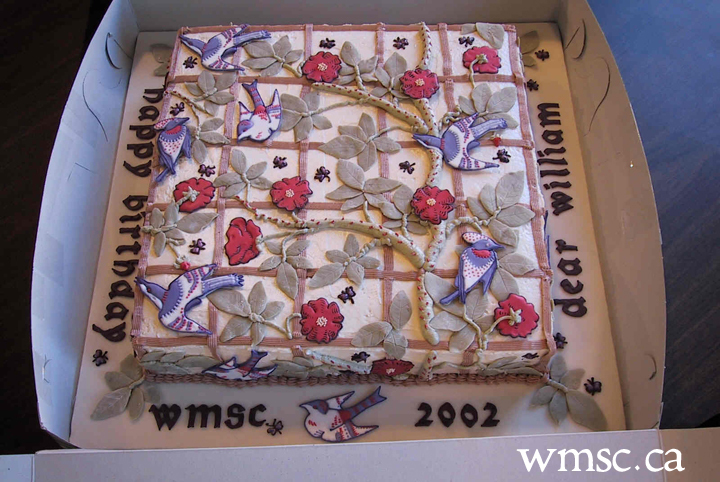 Each March the WMSC holds a lecture or symposium to coincide with William Morris's birthday (March 24, 1834), and it always concludes with a birthday toast, including cake. 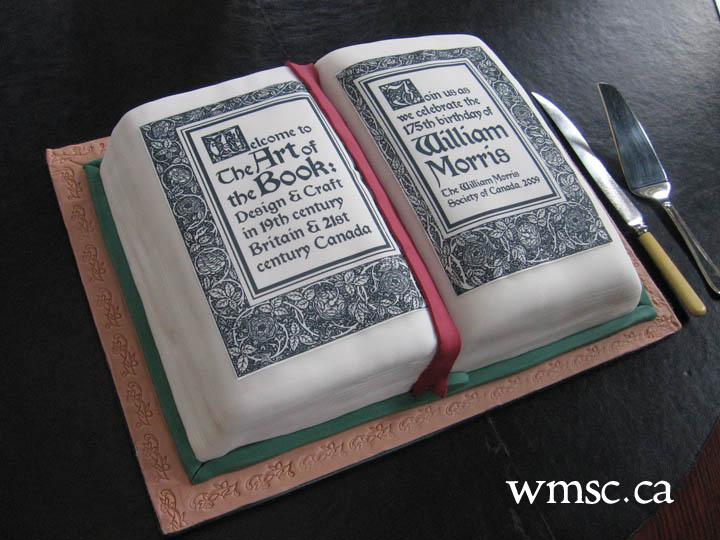 Since 2002, three members, Laura Bright, Gianna Wichelow and James Bailey have created thirteen birthday cakes in honour of Morris. As of 2017, we have added a new baker, Lera Kotsyuba, to the team! 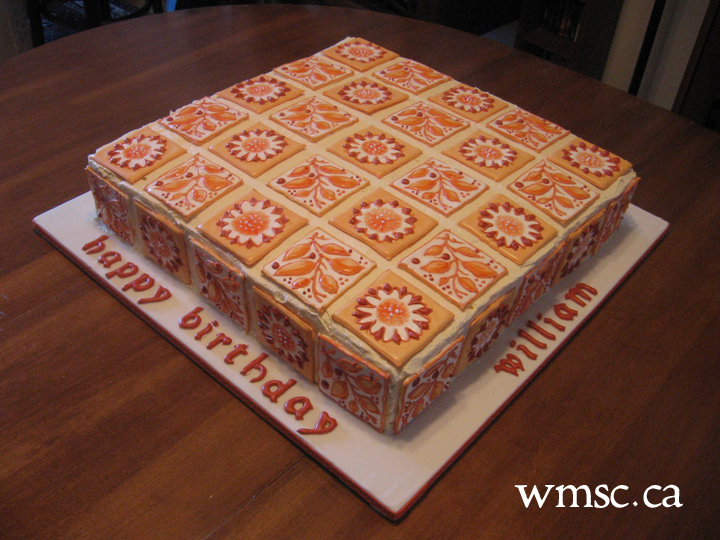 All of our cakes are made from scratch and then covered either in buttercream, or fondant. 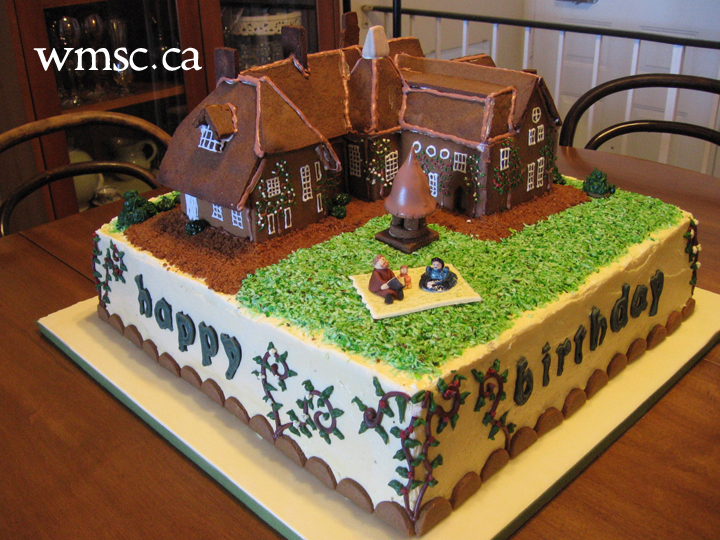 Decorations are made with fondant, royal icing colour flow or chocolate. For lettering, we used the Kelmscott font produced in colour flow. Every element has to be edible! This page is here to highlight those cakes and answer some of the questions that we get on a regular basis. If you have any questions that aren't answered here, let us know at our e-mail address in the right-hand column. 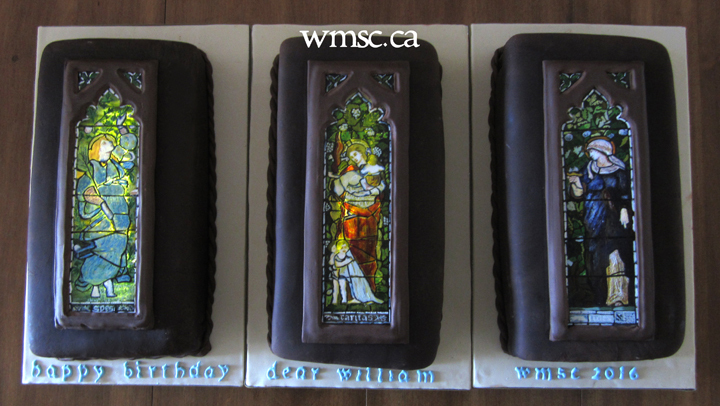 You can see more of the process in this timelapse video of some of our cakes below. 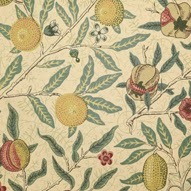 This year the cake was inspired by this stunning "Artichoke" print. An ambitious project undertaken by Lera Kotsyuba. The cake was a blueberry-lemon sponge, with a vibrant passionfruit curd and marshmallow buttercream sandwiched between two layers. 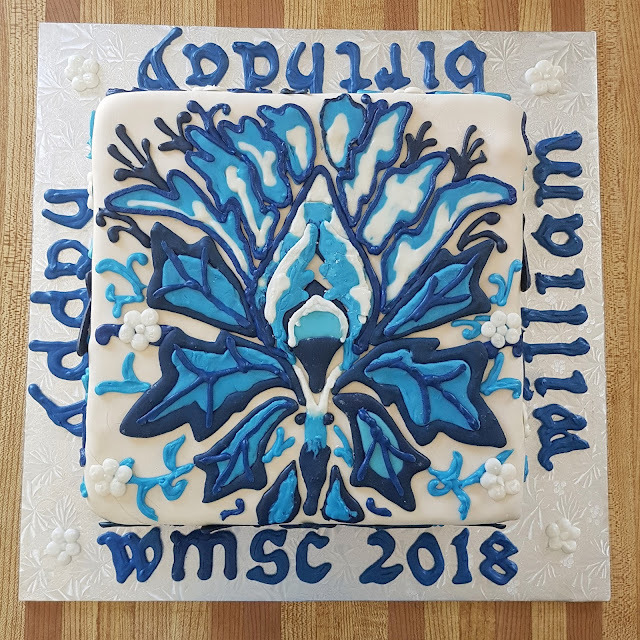 With homemade marshmallow fondant and royal icing decoration in shades of blue. Five days of intense planning and scheduling, with a trial cake, all worth it for this marvellous execution. This year we were inspired by C.F.A. 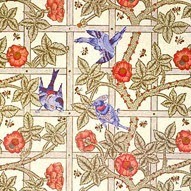 Voysey's "Bluebirds" wallpaper pattern. We were a bit short on time and needed something relatively simpler than the last few years. This took us one day less to make. 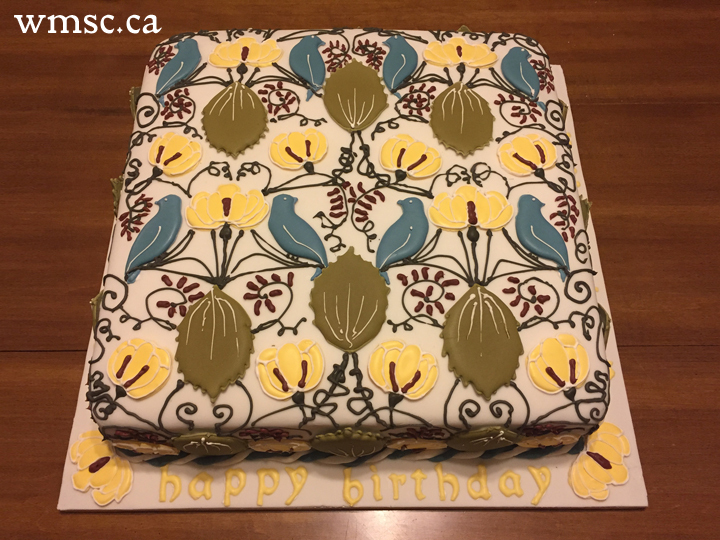 In keeping with the spring like colours, we didn't go with a chocolate cake, but a rich lemon cake (more pound cake than sponge). This was sandwiched with lemon curd, with a crumb coat of lemon/cream-cheese frosting, before the layer of fondant went over the top. We also made a time-lapse video which you can see at the top of this page. And we were lucky to welcome a talented new cake team member: Lera Kotsyuba. 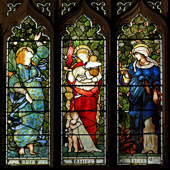 This year we were inspired by Edward Burne-Jones' designs for the "Faith, Hope and Charity" windows for Christ Church Cathedral, Oxford, but which have also appeared in other churches. 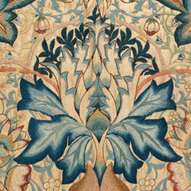 Morris & Co. produced the windows. This was fun, all very new for us and we learned from our mistakes along the way. It's always good to test uncharted waters. 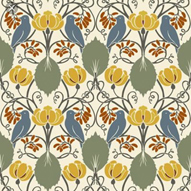 We chose William Morris's Compton pattern for 2015, This was another bold pattern and it was very satisfying to recreate. This time, instead of a fondant covering, we did two thick coats of ganache, which is always amazing. So chocolately and decadent. This is my favourite cake of all. 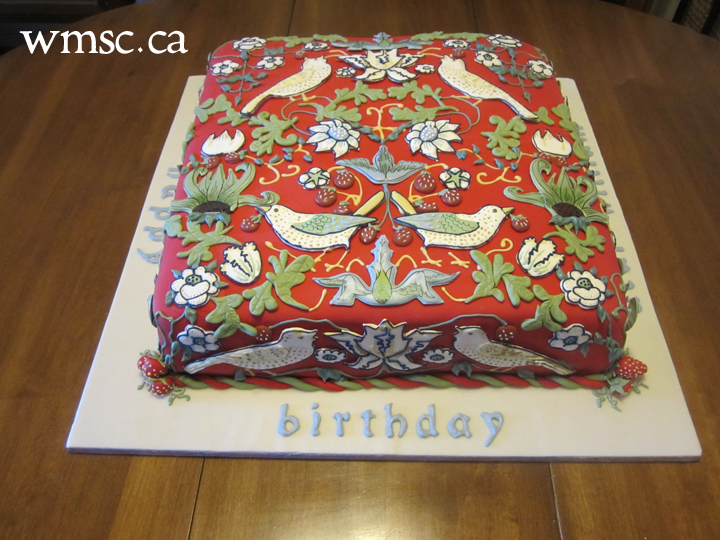 The background fondant was such a perfect red and very bold. This was the first cake I was resistant to cut into. But we did, and it was yummy! It was another hectic year and we needed a change, so we decided to make cupcakes. Using the same rich cake recipe from the previous year, we created 120 chocolate cupcakes that were then coated in ganache and topped with chocolate frosting. 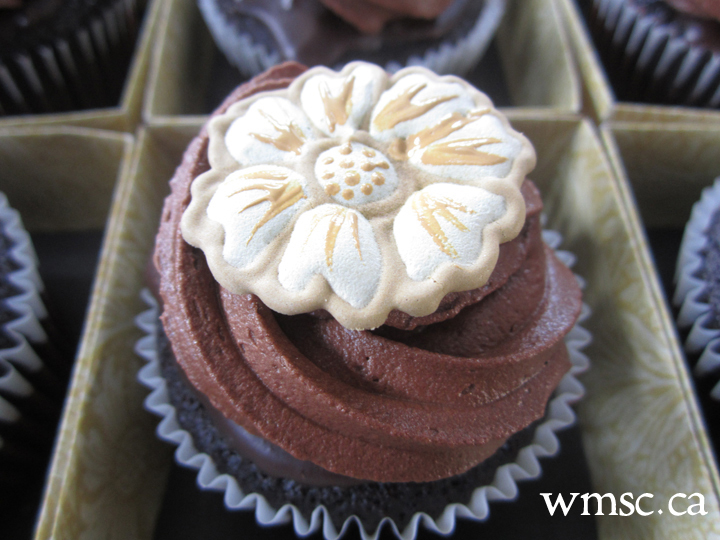 On top of each cupcake went a carefully constructed royal icing ornament, a detail of one of three Morris patterns: Acanthus, Marigold, and Willow Boughs. Each set of cupcakes sat atop a display that James and Laura made, featuring that wallpaper pattern. They also made all the little individual cupcake boxes using the wallpaper patterns again, and these were gorgeous keepsakes in themselves. 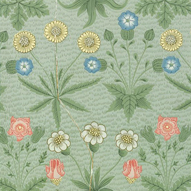 With those horizontal elements setting off the wallpaper patterns, I remember thinking the display looked a bit like Morris and Frank Lloyd Wright opened a bakery together. Or maybe I was high on chocolate fumes. 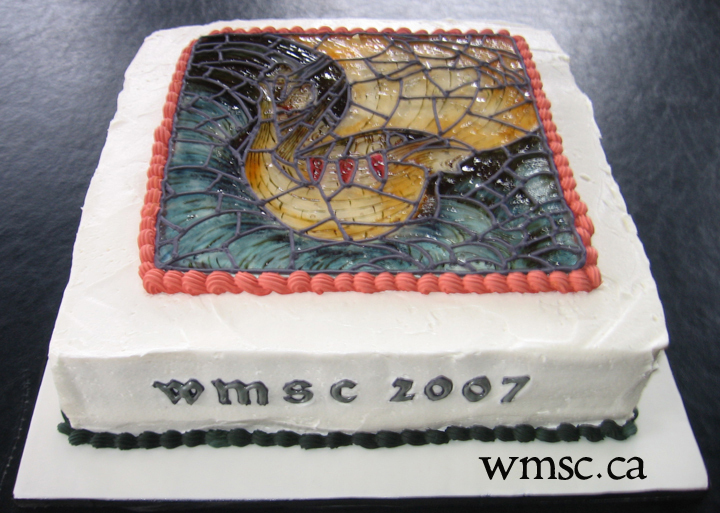 The Motawi Tile Works in Ann Arbor, Michigan, is a favourite destination for all of us, and many other members of the WMSC. Chocolate is another favourite, so we combined these two into our tastiest cake yet. 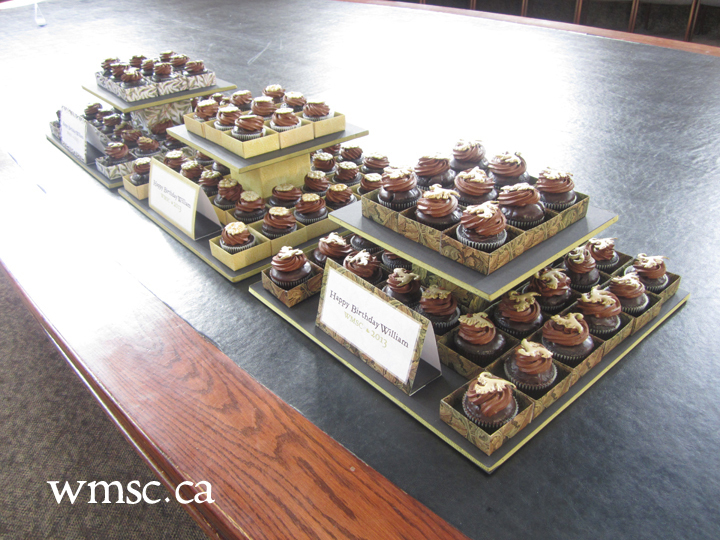 Rich, moist devil's foodcake was sandwiched with frosting, coated with ganache and then set with chocolate tiles. All in all, 15 pounds of excellent dark chocolate were used, mostly Callebaut 72%. This was a sort of double bill, and a real labour of love. A full cake was baked and constructed and then our gingerbread Red House (gingerRED house we called it... heh heh) was built on top. Laura and James sourced the floor plans of Morris's iconic home online and then built a cardboard mock up before we even began baking the gingerbread. This was so much fun, especially making the small fondant figures of Morris and his little family (only one baby at that stage). 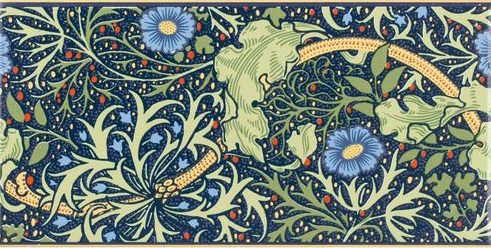 The grass was coloured coconut flakes and the brown earth was ground-up gingerbread. Again, all edible. 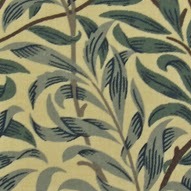 My personal favourite pattern, Willow Boughs, came to cakey life here. 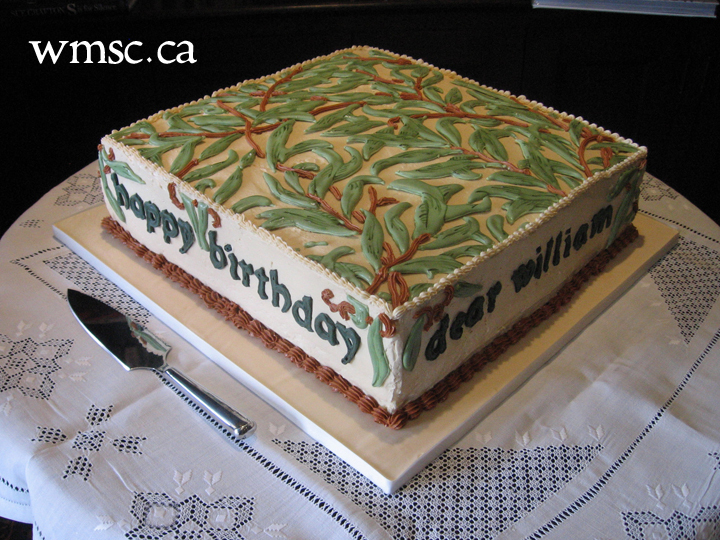 The colours were so soft and only one other person and I thought our willow leaves looked a little like green beans! 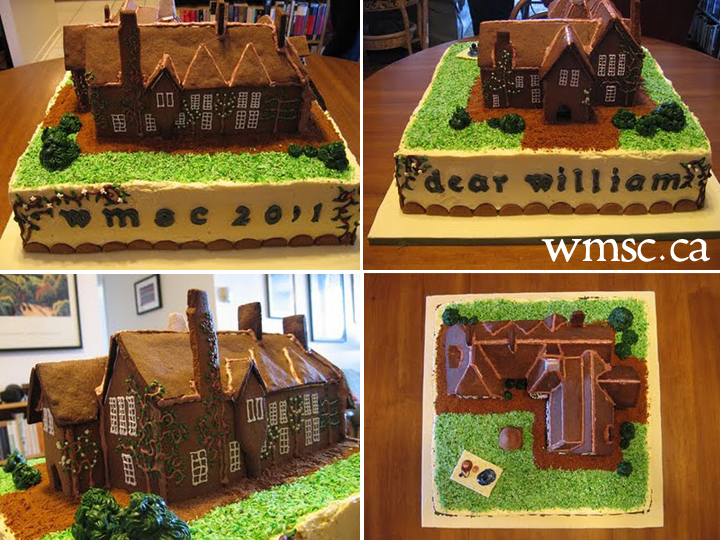 Our symposium this year celebrated the art of the book... so we made an edible book! 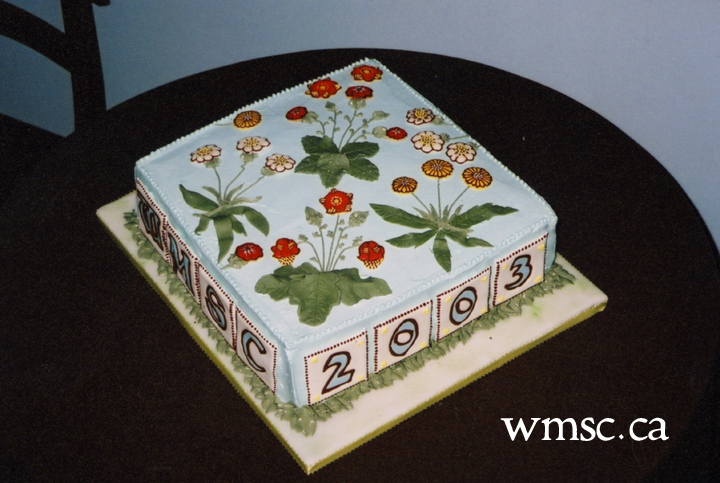 We had the least time available to do the cake, just a day, so we kept things simple, printing the page design on edible rice paper. 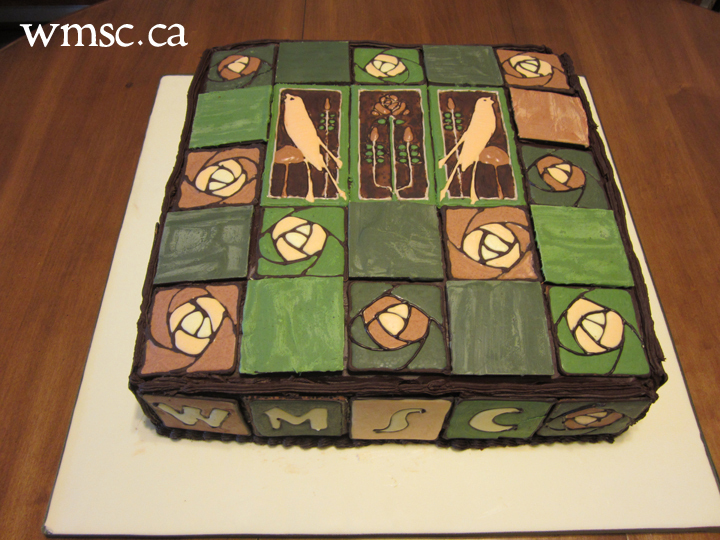 The embossing on the fondant covering the board gave it a sort of leathery feel. 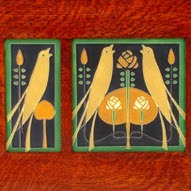 Things got very busy for both of us and being able to make these Morris & Co. Longden tiles by Philip Webb was useful as the sugar tiles could be made in advance but were still very edible. People often ask how we can bear to cut into our cakes. Oh, we're so ready to taste it by the time we cut in to it. We're excited to see how it tastes and share it with our fellow members and guests at the event. Sometimes there's a bit of a battle over who gets what piece of decoration. These tiles were like very thin, edible porcelain. 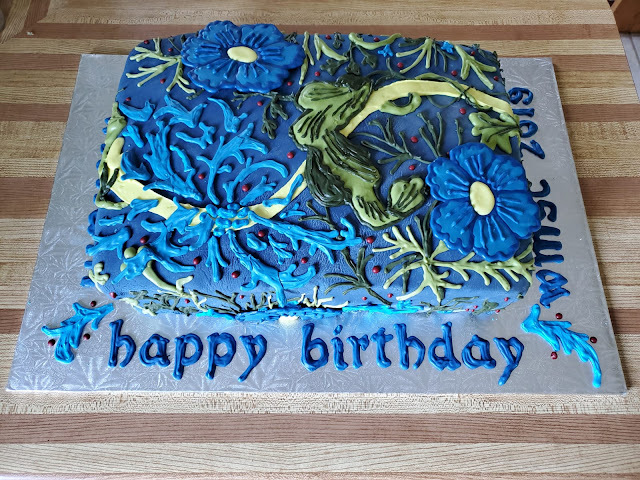 And the longer they sat on the buttercream, the more fragile they became, so it was actually quite easy to cut through them. 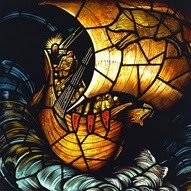 Edward Burne-Jones' Viking Ship stained glass was the inspiration in 2007. We practiced with different sugars and candies until we found an edible sugar glass we could paint on with coloured piping gel. Laura is an artist so it was her steady hand that painted the main image. I love how the royal icing "leading" dried with a matte finish, giving it a very realistic look. 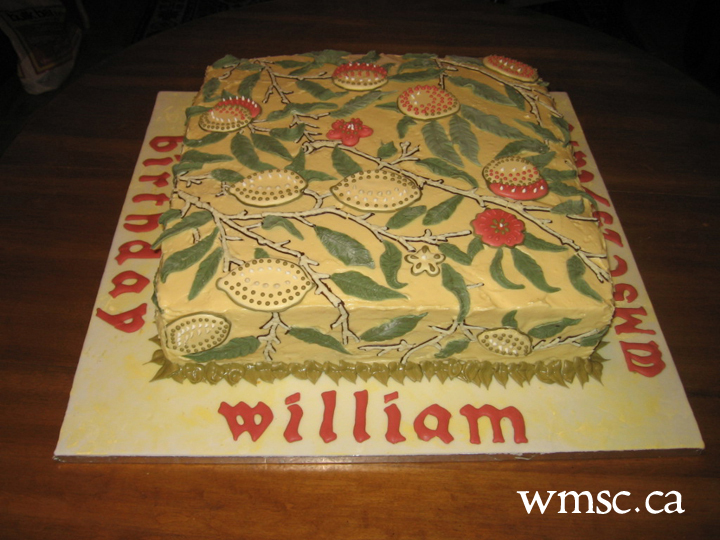 William Morris's Fruit pattern was used for this cake, and it tasted as lemony as it looked. We made a rich lemon curd which was sandwiched between each cake layer. 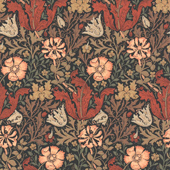 William Morris's Daisy pattern was next. 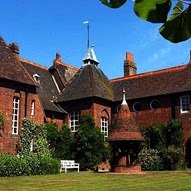 This is the only photograph we have of it. I think we were all about to go digital! 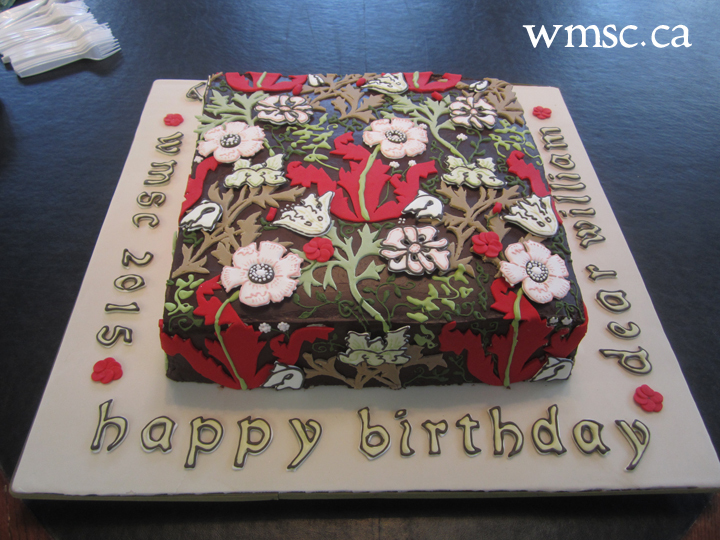 Fresh from cake decorating courses, Laura and I bit off a big challenge with the William Morris pattern, Trellis. We were so spent after working almost all night to finish it, that once we got it in the box for transportation, we were too nervous to remove it for pictures, so there it stayed until it was safely onsite. Later James constructed a much sturdier box that we re-use each year. 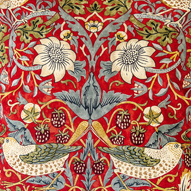 You can see here the delicate work that Laura did with the lovely birds of this, one of Morris's most popular patterns. 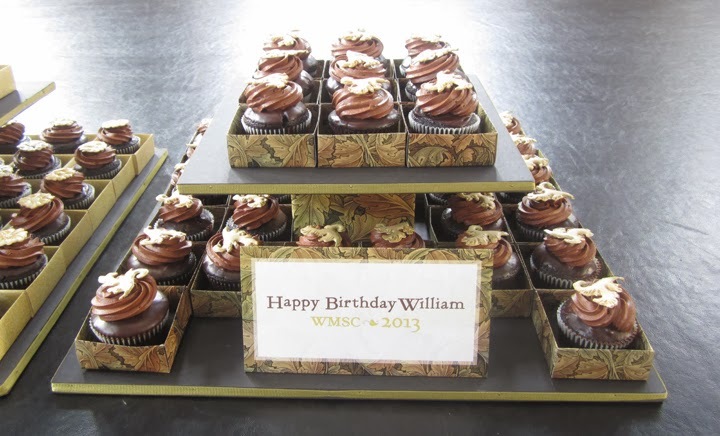 Pictured: The edible William Morris from 2011. Just one inch tall and 100% fondant!